Twitch has introduced an all-new leaderboard and exclusive badge distribution system for active Twitch viewers with the goal of rewarding those who bring something new to the platform and contribute to the streaming site. It’s one more way Twitch is trying to set itself apart from YouTube, which does not have any such system, and where the general fan interaction is known to be a mess. Let’s do a quick rundown of what Twitch has in the bag for its supportive viewers. Clips are custom 60-second snippets of a video shared by creators on Twitch. Following Twitch’s new announcement, viewers who create and share high-quality clips consistently will be rewarded with a ‘Clip Champ’ badge to recognize their support and encourage them to keep going. In order to score a ‘Clip Champ’ chat badge, viewers have to create one clip per week for a channel for four weeks in a row and garner a minimum 50 views cumulatively on those clips. The ‘Clip Champ’ status will appear when users chat in a channel and will also be visible next to their handle on visiting a Twitch page where clips created by them are listed. However, the badge status will be reviewed on a monthly status, so existing Clip Champs will have to maintain their contributing streak to keep the badge. 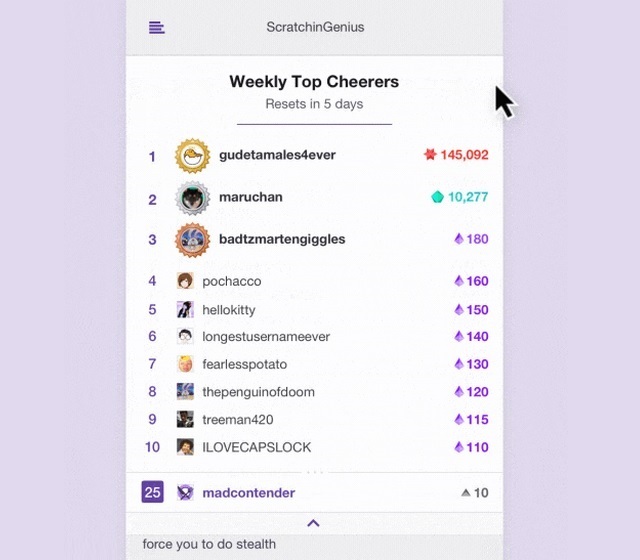 Top Cheerers is a list of the top ten viewers who have registered the maximum number of cheers for their favorite creator using the special animated emoticons, which are purchased using ‘Bits’ on the streaming platform. The Top Cheerers leaderboard usually displays the top three cheerers, but it can be maximized to view the complete top 10 list and also check one’s current ranking. The Top Cheerers leaderboard will be refreshed on a weekly basis. Additionally, the top 3 cheerers will also be eligible for special chat badges to recognize their support for their favorite creators. Furthermore, viewers who have registered more than 1 million cumulative cheers will be awarded Bits badges, which are 10 in number and are granted based on the number of total cheers. The Clip Champ badge is now available for users based on their clip contributions in the previous month, while the Top Cheerer leaderboard and cheerer badges are expected to go live by the end of this month.